One of my goals for My Financial Reviews is to highlight personal finance blogs and sites that I think can help you with your finances. I was fortunate enough to have Phillip from Weakonomics answer a few of my questions on this new project. What’s your end game goal with your Weakonomics website? Having an end game for Weakonomics would require me to have a goal for it. Whatever happens will happen. I’m not opposed to selling it, or I could get too busy and stop writing, or I could make enough money to write full-time. 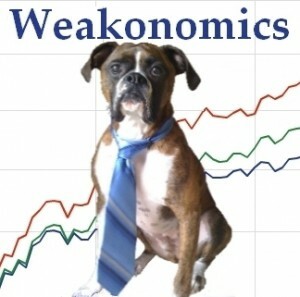 Weakonomics has the potential to be a financial brand, so the possibilities are endless. I’m not after the personal finance newbie. There are already hundreds of blogs and thousands of resources for those people. I’m more interested in educating people who aren’t in the “fixing mode” of their financial life. You don’t have to worry about that next credit card payment, and so you’d rather focus your energy on learning more about the finance side of personal finance. This is of course a reflection of my own life. Bloggers that focus on getting out of debt or finding the right portfolio balance are going through those things themselves. I’m debt free and majored in finance, so at this point in my life those topics are boring. website or column called “Weakonomics.” They weren’t interested (and plus my writing was crap). I sat on the idea for a month or two, then decided to register Weakonomics.com because I loved the word I’d created. The blog was up and running sometime around March of 2008. Like most brilliant minds, I have an erratic schedule. My day job comes in cycles of high volume work and down time. When I have spare time at work I do jot down ideas in an email and send it to myself. Sometimes I will write on my lunch break as well. For the most part I put the posts together at night. I try not to spend more than an hour on my blog every day, but I must admit I do go over. I can’t batch write. The closest thing to batch writing is when I make a really long post and decide to break it up into smaller ones. What normally happens is I start writing something and it leads to another idea. Before I’m done I’ve got four posts with opening sentences on different subjects. Over time I’ll finish them one by one. The biggest bang for my buck has been with search traffic. I write on good topics that entertain my regular readers, but it’s when I answer a question everyone is asking that I get the search traffic. So when people were pulling money out of investments everyone was asking whether they should too. I wrote a post on it. When health care costs were a big debate in the election I wrote posts on the pros and cons of universal health care. It’s answering questions that everyone asks that stand for as much as 50% of my daily traffic. By far my most popular post has been “The Cons of Universal Health Care“. It’s over a year old and still gives me search traffic. I’m working on a follow-up to it, but I keep getting distracted with making lists. I love reading lists and making them for Weakonomics. To date my best one is “Six Lessons Star Wars Can Teach Us About Money” . It looks like a recent post but it’s really just a republishing of the same list I made last fall. The Star Wars community and Personal Finance community alike love it. That isn’t my desire. Blogging doesn’t offer the challenges that finance offers. I’m on a career path that could really put me in a place to solve some serious puzzles. For that matter unless I’m able to start cranking out NY Times bestsellers once a year I’d do much better in the income department continuing to work in finance. But I also know that simply because I feel this way today doesn’t mean I will tomorrow. I want to have a family, spend hours every day with my future wife, and bring my dog to work. I could do this as a writer full-time, and the only way to do this in finance would be if I started my own company and put the Sheconomist to work on making sure my lack of common sense doesn’t destroy the company. Thanks again to Philip for a wonderful interview! Please subscribe to Weakonomics and chat with Phillip on Twitter.